Our pig farming neighbours, Paul and Christiane, have retired this year. 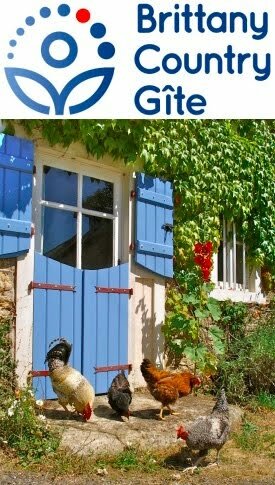 Ever since we’ve kept pigs ourselves, we’ve done an exchange with them, whereby I manage the English-speaking guests in their gîte and they give us all the cereals that we need. It’s an elegant solution. What I give is just a small thing for me (a few minutes on the computer replying to emails, preparing contracts and cycling down to translate on their arrival) but enormously important for them (most of their rental income comes via me). En revanche, considering the scales involved, a few bags of ground mixed cereals is nothing for them but of considerable value to us (compared to the price we’d pay at the local agricultural merchants for similar). We overfed our first pigs, and to lesser degrees the second and even third year before we got it right. The key point was a little bit of advice in Starting With Pigs by Andy Case, “feed pigs by eye”. It’s good advice but requires a level of expertise that only years of experience, and a few fat pigs, can give. In the second year, we started weighing out their food, following a regime from the breeder. The ‘problem’ is that, as they live outdoors, they have access to a whole lot of natural nutrition and we can’t measure how much of it they eat; so one has to learn to feed by eye. We now give our pigs about a third of the cereal ration of their barn-raised cousins … but we do still give them some cereals. There has been lots of building work going on as the new owner brings the buildings into conformity with the latest welfare standards. When I went round to collect the last few bags of feed, that would see our pigs through to the day they left for the abattoir, the machine couldn't be made to work and I left empty handed. What could we do? I was missing the oakey obvious: When we give holiday guests the introductory tour of our permaculture smallholding, we come to the pigs, where I point out what a lovely area they have to free range in. I explain that the pigs eat a surprising amount of grass, root around (for roots!) 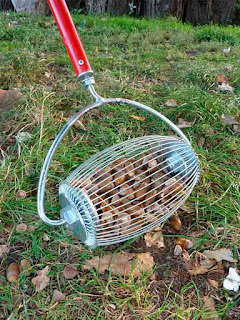 and benefit from excess of cherries, plums and apples as they come into season, and finally acorns from the four mature oak trees that surround the paddock. I even tell them that in Spain, there are pigs that are fed exclusively on acorns to make the very best quality jamón ibérico. It’s been a very good mast year and there is an abundance of acorns. We bought a clever rolling basket device (called a nut wizard) from Martin Crawford at The Agroforestry Research Trust and started to hoover up the acorns. We’ve also been making lots of apple juice. 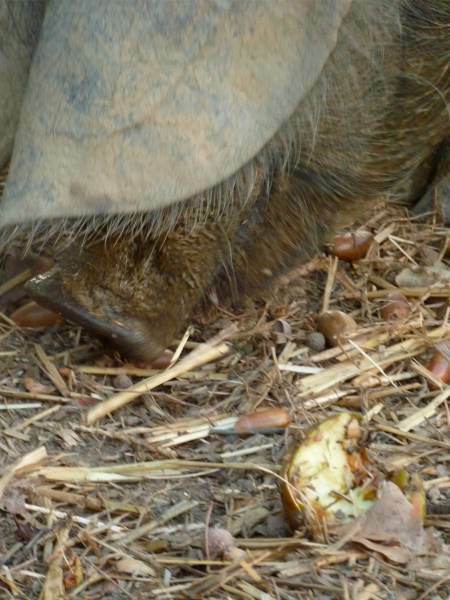 So we finished our three pigs on a diet of acorns and apple pulp and they seemed very happy and suitably heavy. 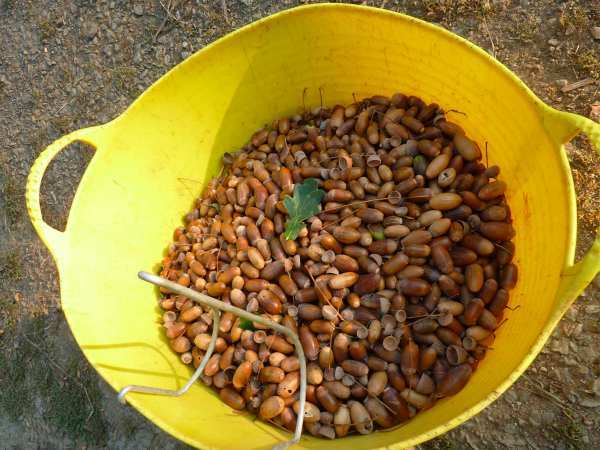 There are so many acorns, we’ve carried on collecting and will try to store them to feed to next year’s pigs before the acorns start to fall again. This is very timely advice! We'll be getting pigs in the spring, probably Berkshires. We have a vast amount of oak trees on our land so it looks like our pigs will be well fed every autumn!